The night time darkness of the canyon was slowly eroding away as I made my way up the trail. I was half a world away from the northeast hardwoods where I first cut my teeth on hunting. I was now in a familiar forest in the Idaho back country. Far away from any man made feature, I found myself in the heart of elk country. I worked my way from camp up the meandering stream bed snarled in a mess of chaparral and pine. The banks of the creek were littered with elk sign as I worked my way a mile or so up the canyon from the rudimentary pack in camp which was miles from the trail head bustling with activity. Once again, as in many years past, I reached the creek crossing and made my way up the shadowed slope of the drainage. The ancient trails were still being used by the elk as they have been for decades before me. I am most at home in the back country and I am very comfortable even when I am the only one there. I was happy to see that my old friends were there to greet me again for another round of fair chase. The bulls answered my location bugle one by one. Several of them I recognized from years gone by, and several were new players to the game. I sat for a few minutes to take in all of the sounds of natures beauty, sounds that haunt me the whole year through. I was not only in admiration of the regal sound of the bulls bugling, but was also gripped by the sound of chattering pine squirrels, the bag pipe whistling of a hermit thrush, and the whisper of the breeze as it passed over the trees above. I worked my way further up the mountain to intercept the herds of elk working their way from their feeding grounds high in the alpine meadows, to where they would spend the warmer part of the day resting in the deep spring filled draws. I passed an old bedding ground with fresh beds along the way. The area was tucked in some old growth pines which towered above the forest floor. The beds were in the soft earth and void of all plant life. Two of the beds were soaked in urine from bulls feeling the urge to bring new life to such a wonderful place. As I stood there I could hear the trickling of a nearby spring. Such a place could be used by the elk to water throughout the day. The hillside was speckled with wallows. Some of the wallows had not been used and were clear, while others were murky and bubbling. I knew now that the elk must be close. I knew that this was where it was going to happen. I carefully set up on the edge of a chaparral strip with the hopes of a bull not being able to pinpoint my location if he were to come in. I went into a series of cow in heat calls followed by the huffs and grunts of a tending bull. Immediately, after only one series of calls, I was answered by a raging bull just up the hill from where I sat. He was extremely horrified at the fact that another satellite bull had hooked one of his ladies from the herd and was not going to stand for it any longer. The sound of thundering hooves came down the mountain towards me. The brush crashed and he was quickly covering the distance between us. Some of the most intimidating sounds were coming from the dark timber above. He was making loud huffing and grunting noises as he made his way. The first glimpse was of his white tipped antlers as he covered the final approach. At this point my arrow was nocked and my release was on the string. I quickly began to judge yardages for the shot. The bull was on his way into a small clearing in front of me which would have put him at twenty yards. I was confident that this was going to be it. This was my moment of glory. The large six point was entering the clearing when he decided to stop. Something was wrong. His sixth sense kicked in. The same sense a hunter feels just before he sees his quarry, the sense that may never be explained and the one that is seldom wrong. Two more steps was all I needed, and the freezer was full. Unfortunate for me, the bull turned around and headed back to where he came, further up the mountain. By this time, the day was getting late and I knew that it was time to head back to the comfort of my camp, and share my story with those I hunt with. I worked my way back down the trail as another day was coming to a close. Another day stored in the chronicles within. Another experience to draw on if the situation should arise. 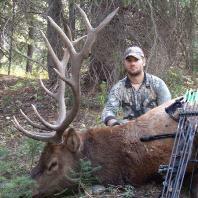 I was fortunate enough to take a bull later that season. I have been blessed through many seasons to take fine animals, but I will never gauge my success on filling my tags. I gauge success on the experience of the outdoors and what nature has to offer. The best days of hunting that I have had, have found me coming home empty handed, filled with the satisfaction of being where I love it the most, in the cool mountain air on a frosty September morning, with the bulls screaming, squirrels chattering, and the breeze whispering through the tree tops………………………………. Very well written. Seeing my buddy from this part of the world headed your way for another fantastic adventure in the Idaho splendor made me question my decision to stay home. 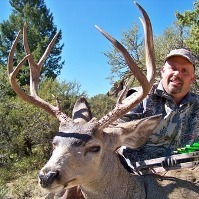 My your hunt be blessed with multiple close encounters, tremendous weather and success on those monster branch bulls. Hard to believe it has been three seasons since I was able to experience what you so accurately describe. Good luck.